70 kcal per bar. Suitable for vegetarians.So, you're trying to be healthy,* but fancy a tasty snack to get you through the day... Easy! 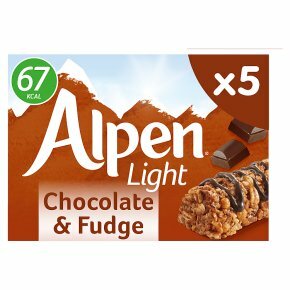 Every 70 calorie Alpen Light bar is packed full of tasty ingredients... Full of delicious chocolate and fudge chunks and creamy rolled oats, topped with a delicate chocolate drizzle - Snacking at its peak! *Reducing your consumption of sodium contributes to the maintenance of normal blood pressure as part of a healthy diet and lifestyle. Contains half the fat of an Alpen Fruit & Nut with Milk Chocolate bar - 6.5g per 100g. Alpen Fruit & Nut with Milk Chocolate bar - 13g per 100g. Comparison verified January 2014.